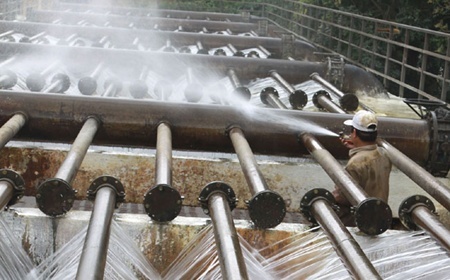 Some people in Ha Noi are having problems with the water they get from their taps. It often has awful mud in it, which is not healthy to drink or even to touch. Special checks have been done to try and find out the cause of the problem and to fix it. People living in apartment buildings of the capital's new urban areas are expressing concern over poor-quality tap water. An apartment building is a tall building that has many homes in it, on its different floors. Urban areas are town areas. The opposite of an urban area is a rural area. Farms and forests are in rural areas. Poor quality means of low standard. The legal limit is the most that is allowed, according to the law. Arsenic is a type of poison. When something is transferred it is sent from one place to another place.. Routinely means happening according to a schedule, or a plan. Substandard means below the standard that is expected. Words in English beginning with "sub" often mean something to do with the word "below". Think of submarine! It would be difficult for the company to do tests on every drop of water, so instead it takes tests of a small amount of water and trusts that whatever is found through these small amounts of water is what would also exist in a larger body of water in the same place. These small amounts of water that are tested are called samples. A directive is an instruction or a command. Authorised agencies are offices that have the power to do certain things. A survey is a study carried out that involves asking people how they have experienced something. Respondents are people who take part in things like surveys and answer questions that are put to them. Manganese and iron concentrations are the amounts of those minerals in a mix with another substance, such as the water. The level of chlorine was found to be lower than the required amount in tap water in the Binh Tan and Nha Be areas of District 8. Traces of coliform bacteria, which can cause diarrhea, were found to be 10 times higher than the permitted level at a range of water stations in District 8. Diarrhea is a disease that causes one to go to the toilet very uncomfortably and can be caused by drinking dirty water. A permitted level is an amount that is allowed. 1. A type of poison. 2. A tall building with many families' homes in it. 3. The colour sludge becomes when water is boiled. 4. The month in which the results of a survey was released. 5. The kind of area in which you would find a forest. 1. Arsenic; 2. Apartment; 3. Yellow; 4. August; 5. Rural.